Yuanyuan Shi receives the prestigious EDS excellent PhD student award. 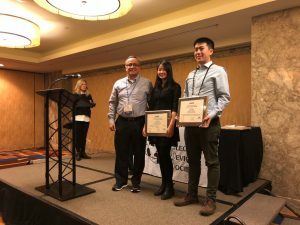 The prize was given in a solemn ceremony at the 2018 International Electron Devices Meeting, held in San Francisco (USA) between December 1st and 5th, 2018. Starting from 2001, three winners are selected worldwide to receive the award each year to promote, recognize and support PhD level study and research within the EDS field. Yuanyuan Shi shared the stage with Fernando Guarin (president of EDS and Junkai Jiang (another winner). Congratulations, Yuanyuan !